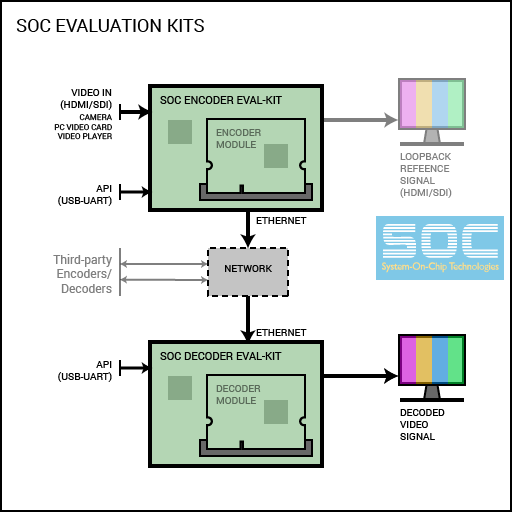 Our evaluation kits provide the easiest way to get started with our codec technology. Kits are used to evaluate the quality/capabilities of SOC codecs, for product demonstrations, and product-development. The kits contain a module with the CODEC engine, a carrier board with all the necessary I/O ports, and all the cables and documents needed to get it running out of the box. The carrier boards and modules are user-reconfigurable, so developers may use them as product-development platforms after evaluation stage.